15 Pittsburgh Kid Friendly Events not to miss in August! Credits goes to the Visit Pittsburgh website. From 12PM to 10PM is the very first family community party kicks off on the first day of the month. Hosted by Believe it or not this event has been going on for five years strong and is always a beautiful turn out. Food, LIve music, to flea markets and lots of other activities for you and your kids to enjoy through out the entire day. Deadpool and Kanti Kasa will be there as Moana! What's unique about this event is that not only is it a party but a cause is also involved. The cause involves keeping the neighborhoods within the Pittsburgh area connected and growing together so that everyone's children would know each other, an even better reason to come around. The entire schedule can be found in our Events page. Whenever you think of this date you think of the Regatta but what about the Harambee? Try something new! A mixture of culture and absolute fun is the Harambee. The 50th celebration of culture, art, and creativity. Learn about history while partying and doing other fun activities. It kicks off firstly with a parade on the first day at 6PM, but the event in itself is from 2PM to 8PM. Food, Vendors, Live music, and lots of children activities. A Health and Wellness Workshop will be featured during the event courtesy of Creative Balance 4 Empowering People. 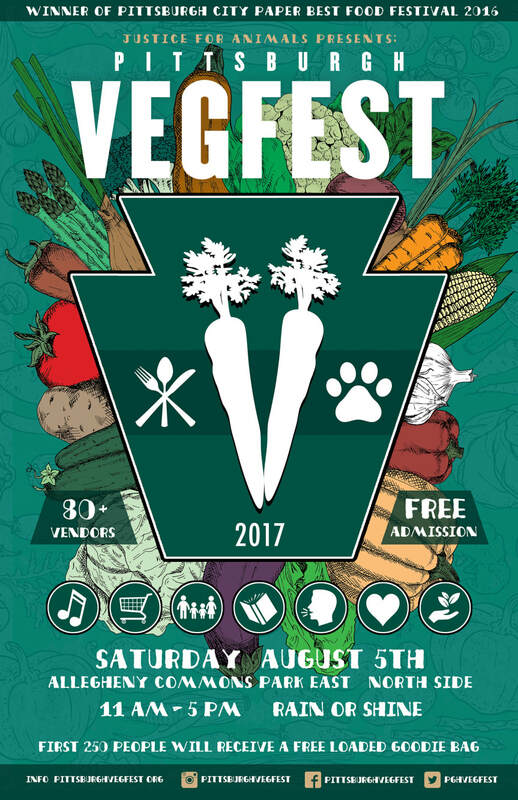 That juicy BBQ steak is good but take a break from it and see what's in today, the greener and vegetarian life of Pittsburgh. Just like all the other events that were listed, lot of family activities are involved, including a goodie bag for the first 250 people that shows up. As listed on the flyer, eighty(80) plus vendors will be involved. Learn to stay and be healthy in ways you probably never knew, and eat in style. From 11AM to 5PM, you could always stop pass this event then head back to Harambee when it's over. Put the pedal to the metal, get up, get out, and exercise! Who doesn't like riding bikes? What's wrong with getting a little bit of exercise? I don't know about you, but fun activities that involve exercise is my kind of event. This event is widely spread out for others to participate and be involved. There are different things happening every eventful day on the calendar, it is full of nonstop fun and complete awesome. Quick, hurry up and register for your very own pedal PGH experience. Turn off your radio and go see a live band with FREE admission in an outside area/environment. This is the 14th annual Black Family Reunion. No, it's not your regular family reunion, it's an event that everyone's invited to, a reunion for the people not just one in particular family. This even has a theme, and that is; Moving toward economic, racial & social justice. Like the PGH Bike Fest, it's widely spread out so that it could work around your schedule. Visit their Facebook event page. Always been interested in things that are different? Ever wanted to take your family out to something like a runway modeling event? 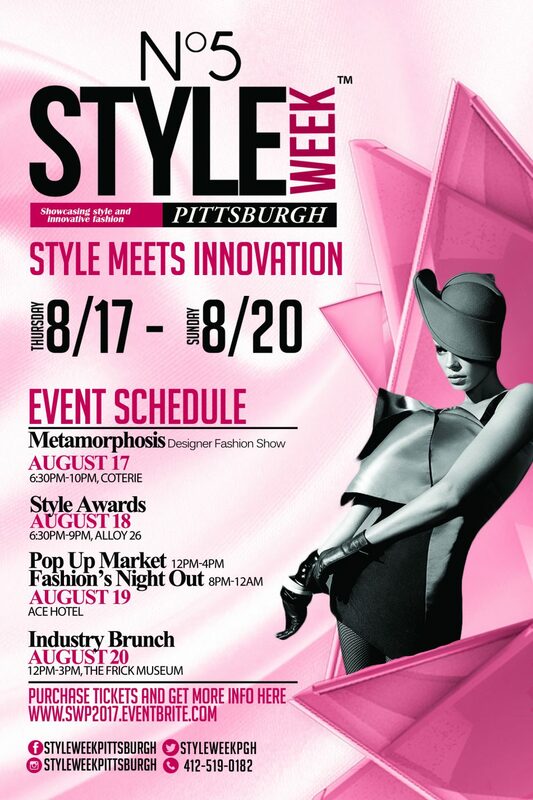 Explore the unique trending fashions of Pittsburgh and be the first to witness some NEW trends that will be happening in the Burgh. Lots of professional models and people will be involved, including the mayor of Braddock. View the schedule and get yourself some tickets! The Flyer is self explanatory in itself, it's time to cook out! Hosted by Master Yusuf Owens. Music: DJ Kanti Kasa. 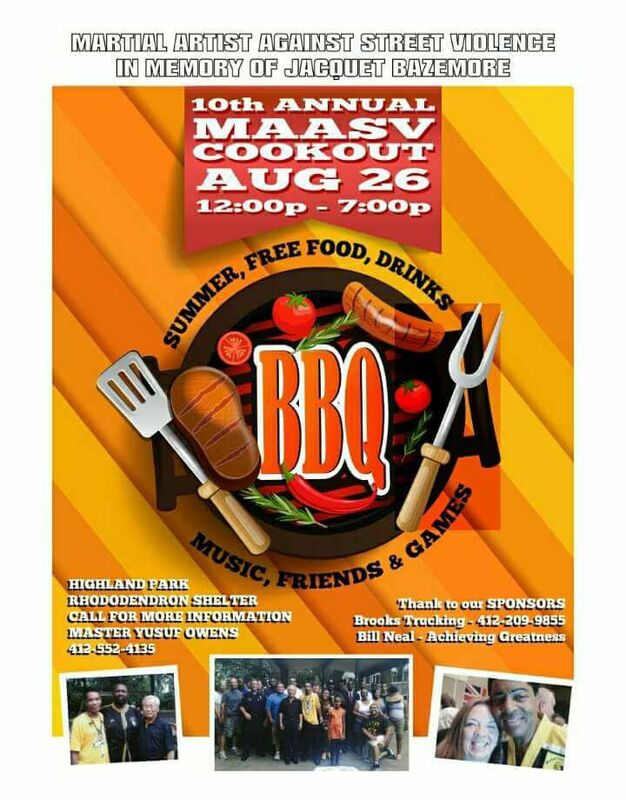 Martial Arts Against Street Violence(MAASV) has put together once again, a large cookout, and invites everyone to stop by and enjoy the music, eat, dance, and make new friends. What other perfect way to end the month than to party and eat with a bunch of martial artist? Learn about Taekwondo and what it means to be a martial artist, learn that self control is a key and one of the balances of life. The food is FREE and the venue is great! 8. Feastival: August 26TH 3–9 p.m.
Find out why the Rocks totally Rocks at Feastival. What began in 2013 as a neighborhood pop-up attracting several hundred people is now a full-fledged festival marking its fifth anniversary. Showcasing the cultural and culinary amenities of the-little-borough-that-could along the south bank of the Ohio River, Feastival is a stimulus for revitalizing the McKees Rocks business district. Family friendly activities, food trucks, vendors of all sorts, and amazing talent showcasing. Comfortable Soaks presents; Shake The Foundation. The perfect Back To School event that you and your children will enjoy. No more slacking around, school is BACK. This event is a large and welcoming block party, which is hosted by Brother Shields and features all sots of spectacular talents. Vendors and other activities included, if you've never ridden a horse before, well now you'll be able to. DJ KK will be providing the music and a fancy Car Show is underway. 12PM to 7PM, this is a free admission event, however, you can choose to donate to charity. Check out the entire schedule. Of, course! One of Pittsburgh's most popular events, the Regatta. Which has been going on for YEARS. Wonder why? Check out the website and schedule. Looking for the last 5 events? If you know any other events that are kid friendly feel free to leave us an email and we'll make sure to add it. ﻿Where To See The Orionid Meteor Shower In And Around L.A.
Look up! The annual Orionid meteor shower is hitting the skies tonight, and it's shaping up to be a pretty epic show. According to NASA, this year's Orionids are technically be active from October 4 to November 14, but they will be peaking tonight and in the wee hours of tomorrow morning. The best time for viewing will be just before dawn on Friday morning. Contrary to popular belief, meteor showers have nothing to do with shooting "stars." They are actually made up of little pieces of cosmic debris called meteoroids (hence the name) streaming into Earth's atmosphere at super fast speeds. What you are actually seeing with the Orionid meteor shower is space litter from Halley's Comet. Halley's Comet—not to be confused with the comet that inspired 39 Heaven's Gate members to commit mass suicide, that was Comet Hale-Bopp—is only visible from Earth every 75 years. It last appeared in the inner parts of the Solar System in 1986. You can pencil the next Halley viewing into your calendar for mid-2061, though if you are 33 or older you will probably be dead by then (average American human life span = 78 years, the rest is simple math). Stuart Seto, a meteorologist with the National Weather Service, told LAist that it looks like clear skies ahead for both the city and the surrounding coastal and mountain regions on Thursday and Friday night. There may be more cloud cover (and less visibility) on Saturday as a low-pressure system moves down towards Los Angeles. That said, the real threat to sky-show visibility isn't clouds so much as light pollution. According to Stephen J. Edberg, an astronomer at NASA's Jet Propulsion Laboratory, "Our cities generate a lot of light that wipe out everything but the brightest stars, so you'll want to be somewhere that is as dark as possible." This year's Orionid shower, however, may also be marred by light from a more natural source: the moon. The waning gibbous moon will not only be visible in the sky almost all night long, but more than half (62 percent, to be exact) of its surface will be illuminated when the shower peaks early Friday morning. The Orionids appear to generate from the Orion constellation, so that's where you should be looking in the sky. For an optimal viewing experience, NASA scientists also recommend getting yourself situated in the dark at least thirty minutes before you're planning to watch so your eyes have time to adjust. Some relatively easy locations for viewing include the Angeles Crest Highway (just start driving until you find a nice place to pull over), the Parker Mesa Overlook in Malibu, Upper Las Virgenes Canyon Open Space Preserve in western L.A. County/the near side of Ventura, and Los Arboles Rocketship Park in Torrance. You can also evaluate possible locales using this handy light pollution map. Some relatively easy locations for viewing include the Angeles Crest Highway (just start driving until you find a nice place to pull over), the Parker Mesa Overlook in Malibu, Upper Las Virgenes Canyon Open Space Preserve in western L.A. County/the near side of Ventura, and Los Arboles Rocketship Park in Torrance. You can also evaluate possible locales using this handy light pollution map.Look up! The annual Orionid meteor shower is hitting the skies tonight, and it's shaping up to be a pretty epic show. According to NASA, this year's Orionids are technically be active from October 4 to November 14, but they will be peaking tonight and in the wee hours of tomorrow morning. The best time for viewing will be just before dawn on Friday morning. Roxanne Jones a founding editor of ESPN Magazine and former vice president at ESPN, has worked as a producer and as a reporter at the New York Daily News and The Philadelphia Inquirer. She was named a 2010 Woman of the Year by Women in Sports and Events. Jones is a co-author of "Say It Loud: An Illustrated History of the Black Athlete" and CEO of the Push Marketing Group. The opinions expressed in this commentary are solely those of the author. (CNN)Unapologetically black, that is the attitude that Beyonce -- and to a large degree Carolina Panthers quarterback Cam Newton -- brought to Super Bowl 50. And as a lifelong NFL fan who's attended more than 15 Super Bowls, Bey and her perfectly timed, bold, Black Panther-inspired halftime tribute was a beautiful thing to behold. It was everything. Without asking for permission, Beyonce redefined what it means for a celebrity to command the stage while the whole world is watching. Going beyond the game and the glitter, the 34-year-old pop icon used her star power to shine a light on the problem of race in America. Singing a cleaned-up version of her new single release, "Formation,"Beyonce dared to use the nation's most-viewed event as a platform to shout #blacklivesmatter. There were nods to Michael Jackson, to Black Greek step shows, to Malcolm X and a salute to the 50th anniversary of the founding of the Black Panthers. For a minute, watching Beyonce and those strong black women sporting black berets and big afros march out onto the field, I forgot I was watching a Super Bowl performance. For the first time I felt like I wasn't just a spectator of the game but that the game had become a part of my black experience in America. With just a few lyrics, Beyonce connected with black women everywhere. Her performance became personal. Add in the pro-LGBTQ messaging of Coldplay's performance and the soulful rendition of Lady Gaga, who has long stood with the gay community, belting out the national anthem, and you have a vision of an America that I aspire to live in one day. A nation where equality and justice aren't just reflected in the words we recite, but in our everyday interactions with one another. It is a vision of America for which men such as Malcolm X, the Rev. Martin Luther King Jr., Huey Newton and too many of my ancestors and their advocates fought and died. Sadly, it is a vision of America that still scares some people. So predictably, the Beyonce bashers were out in force, calling the halftime performance politically charged, an assault on police officers, scandalous. "This is football, not Hollywood," former New York Mayor Rudy Giuliani complained later, showing just how out of touch he is with sports culture. The truth is the star-studded, billion-dollar industry that is the NFL merged with Hollywood long ago. The problem is that Giuliani and those critics are out of touch with a lot more than sports. They are out of touch with America. They act as if the devastation of Hurricane Katrina, which disproportionately affected poor blacks, didn't happen on American soil. As if, far too many unarmed black men and boys haven't been shot and killed by police officers on American soil. As if, systematic racism doesn't exist in America. And, as if we don't have a right to protest this brutality and demand law enforcement reforms by proclaiming #blacklivesmatter. Like it or not, Giuliani, Beyonce's message was right on time. Beyonce gets political at Super Bowl, pays tribute to Black Lives MatterHer "Formation" video features scenes of a young black boy dancing in front of riot police, who signal their surrender by putting their hands up, referencing the "Hands up, don't shoot" anthem of the Black Lives Matter movement inspired by the 2014 killing of Michael Brown in Ferguson, Missouri. Tidal, the streaming service of her husband, Jay Z, reportedly plans to donate $1.5 million to Black Lives Matter. We tend to criticize celebrities for talking about politics, for taking a stand on serious issues. We resent it when stars such as Cam Newton confront race head-on as he did before the big game, saying that many fans dislike him because he's a brash, black quarterback. But in our pop culture-crazed, message-driven world, there's no denying celebrity voices can influence the lives of many. Celebrities such as Beyonce, Lady Gaga and Bruno Mars are part of a refreshing generation of famous voices who are showing that fame can and should be used to push for social justice. So I say, thank you Queen Bey, for having the creative courage to join the fight for justice. You slayed. Fox is betting that audiences will not get a load of Deadpool when the movie opens this weekend but will immediately want more, which is why the studio is already working on a sequel. Rhett Reese and Paul Wernick, who wrote Deadpool, are writing the script for a follow-up, which has already been greenlighted, insiders tell The Hollywood Reporter. keeping the creative team together. Deadpool is an R-rated action comedy based on an irreverent Marvel Comics character who is part of the universe of X-Men heroes, to which Fox has the license. ​Reese and Wernick’s other credits include Zombieland and G.I. Joe: Retaliation. The duo is repped by WME and Hansen Jacobson. FANTASY CREW'S WHHA RADIO SHOW WILL BE THERE! AND WHHA'S VERY OWN KANTI KASA WILL BE PERFORMING! Featuring music, food, dance, arts, crafts, and children's activities from Latin America and the Caribbean. Sponsored by: The Center for Latin American Studies (CLAS), Med Health Services and the Pittsburgh Cardiovascular Institute, and the Pittsburgh Pirates.